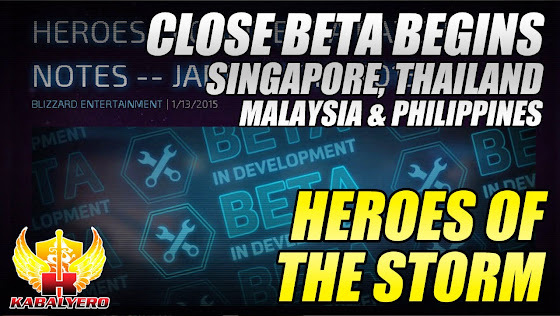 Heroes Of The Storm, Close Beta Begins, Singapore, Thailand, Malaysia & Philippines - KABALYERO - PLAY, BLOG & EARN! Heroes Of The Storm Close Beta begins today, January 14, 2015, in Singapore, Thailand, Malaysia and Philippines. If you are a Heroes Of The Storm player or fan in Singapore, Thailand, Malaysia and the Philippines who wants to get in the Close Beta of the game then all you have to do is get your Close Beta Key from Asiasoft's Heroes of the Storm Beta Key Redemption App. Heroes Of The Storm Close Beta will feature a New Battleground called the Sky Temple, a New Hero named Thrall, a New Ranked Play Mode called Hero League, pick your Heroes in Draft Mode and enjoy Weekly Sales. Interested? If you are then simply go to Asiasoft's Heroes Of The Storm Facebook page. The link is in the description of the video below or you can simply click here.